Michael Cohen, Donald Trump's once fiercely loyal lawyer, has struck a plea deal with prosecutors investigating possible campaign finance violations and tax fraud. Who is he anyway? When an FBI team raided Cohen's office in New York on 9 April, they arrived at a workspace fit for the silver screen. It's 30-odd floors up at 30 Rockefeller Plaza, in a corner - but not very spacious - office at the Squire Patton Boggs law firm. Cohen's office is decked out with paraphernalia from his time at the Trump Organization and on Trump's presidential campaign, as well as from superhero movies - Thor's hammer, Captain America's shield. Also hard to miss - a nearly full-length impressionist-style painting of Cohen himself at the press secretary's podium in the White House briefing room. Cohen has remained in Trump's inner circle for more than a decade, during ups and downs at the Trump Organization and on the campaign. 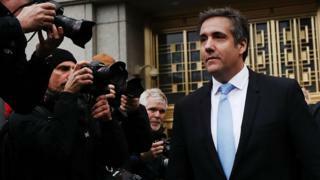 But as Cohen has been named a subject of a federal investigation in New York, his relations with Donald Trump have deteriorated. Cohen, 51, had prided himself in going above and beyond the line of duty as the president's personal lawyer. He considered himself Trump's protector. He'll do anything for him, telling Vanity Fair last September he'd "take a bullet" for the president. The day before the FBI raid, Cohen tweeted a month-old story about him with a Joyce Maynard quote: "A person who deserves my loyalty receives it" followed by his own pledge: "I will always protect our @POTUS @realDonaldTrump #MAGA". Cohen is the son of an immigrant who escaped a Nazi concentration camp in Poland. He grew up in Long Island, right outside of New York City, before attending American University in Washington and Cooley Law School in western Michigan. Back in New York, Cohen worked at a law firm, married an Ukrainian immigrant, ran a successful taxi business and made a failed run for New York City Council, all before entering Trump's orbit. Cohen was introduced to Donald Trump by his son, Donald Jr, in 2006. Cohen's family had purchased a number of properties in the Trump World Tower near the United Nations, and Cohen had become the treasurer of the building's board. He had grown up idolising Trump, reading The Art of the Deal multiple times. So when Trump offered him a job after he had advised on a few legal matters, Cohen was shocked. He took the job, becoming executive vice president and special counsel at the Trump Organization in 2007. From then on, he was practically part of the family - close with Trump's adult children, regularly dining with them and their spouses. He was also an early fan of the idea of President Trump. In 2011, he helped launch a website, Should Trump Run?, to gauge public opinion. He was on board when Trump announced his candidacy in 2015. Cohen's been described as the president's "pit bull" and extension of Trump himself. He speaks with a thick Long Island accent and avoids alcohol much like his boss. Cohen is high energy, speaks assertively and has an affinity for Hermes belts and eccentric jackets. Cohen is not press shy. He prides himself on taking everyone's calls. When a CNN published a story about his role in covering up Donald Trump's alleged affair with adult film actress Stormy Daniels, he texted it to me. "How do you feel about being called fixer?" I asked him. But he's also visibly affected by what's written about him. In late 2017 at the Trump International Hotel in Washington, Cohen was heard complaining about a recent story written about him. He called it "fake news," saying the only news anyone should believe about him is what comes out of his own mouth. Well before the FBI raid, Cohen was named as a key figure in the alleged Russian effort to sway the 2016 presidential election in Trump's favour. The "Steele Dossier" - a report by ex-British spy Christopher Steele, who was hired by research firm Fusion GPS to investigate Trump - specifically points to a trip Cohen allegedly made to Prague in late summer of 2016 to meet Kremlin representatives. Cohen has repeatedly denied the report or having ever been to the Czech Republic. He recently tweeted another denial in light of a new report claiming Mueller has proof backing up that element of the dossier. But it began to unravel for Cohen when the news broke of a hush money payment he made to adult film actress Stormy Daniels - who claims she had an affair with Trump before he was president. Since Special Counsel Robert Mueller began his investigation into possible campaign collusion with Russia, Trump had been advised by his other lawyers to keep his distance from Cohen. However - perhaps in a signal of loyalty - Trump had dinner with Cohen the night before Daniels' interview aired on CBS' 60 Minutes. The raid on Cohen's office and hotel in search of files related to the Daniels payment and other matters, however, was a surprise. "No-one saw this coming," a source familiar with Cohen's thinking on the matter said. Out of all the possible persons of interest to Mueller, Cohen has been closest to the president the longest - save the members of Trump's immediate family. He knows the most. And his legal troubles in New York come from a "referral" from the special counsel's office. The southern district of New York - where Cohen's case is being handled - is known for being aggressive. As the federal prosecutors reportedly considered charges against him, his loyalty to Mr Trump seemed to soften - he told ABC News that his top concern was his family. In the immediate aftermath of the FBI raid, Trump came to his friend's defence - both on Twitter, complaining of a witch hunt, and in person, calling Cohen a "good man". But his tone soon changed when Cohen's lawyer released audio of a conversation he had with Mr Trump about the Stormy payment. There were also reports that Mr Cohen claimed Mr Trump knew in advance of the infamous Trump Tower meeting in 2016 where Russians met members of the campaign with the promise of offering dirt on Hillary Clinton. Rudy Giuliani, Mr Trump's current lawyer, said Mr Cohen had "lied all his life". It means that while Trump could theoretically offer a presidential pardon to his former lawyer - as he recently did for Bush-era White House aide Scooter Libby - that now seems a remote possibility.